Transferring a domain name from one host to another can be a royal pain in the backside. It doesn’t matter if it’s a .com, .co.uk, or any other weird and wonderful suffix that’s doing the rounds (.ninja anyone?!) it can be a black art even for the most seasoned professional. We’ve prepared below some helpful advice for guiding you through the whole process and having over a decade of experience in dealing with hundreds of transfers for our customers, we have come up with 5 top tips to make sure your transfer goes as smoothly as possible. You have appointed different web designers to build your new website, and as they will be hosting your new website they need access to your domain. You may own lots of domains that you have bought from different registrars and as they all sit on different control panels they have become a pain to manage. Transferring them all to one provider makes sense and certainly easier for you to control. It may be that you can simply get a better deal somewhere else. Either the yearly registration of the domain or hosting is cheaper or they simply offer better features than your current hosts. 9 times out of 10 it should cost you very little (maybe the cost of your domain re-registration) if anything at all, with careful planning as discussed in our top tips there should be virtually nothing to pay. If you are transferring the domain to your new web designers, with careful negotiation at the start, the cost of re-registering the domain with their hosts and the setting up of all your associated email addresses should be included in the cost of the project. You will normally pay upfront for the next years hosting, but this is a cost you would have had to pay your existing company anyway. Do I still own the domain? Just because you are transferring the domain to another host, if doesn’t mean you are no longer the owner. If your domain has been correctly registered in the first place with you as the domain owner, no matter where you transfer the domain to, you will always remain as the owner and only with your permission (normally through the email address you have registered in the owner details) can this be changed. 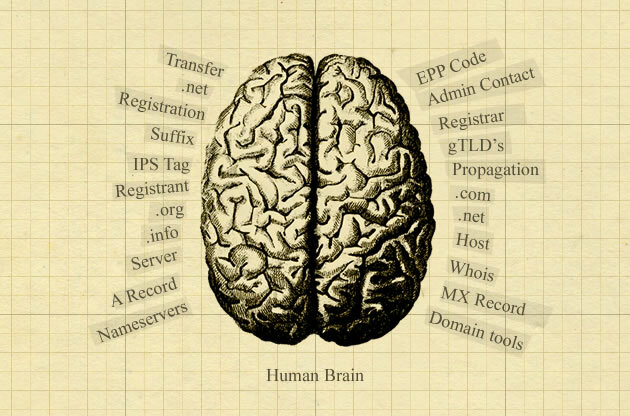 There are some great tools online to look at a domains registration details, commonly referred to as the domains Whois. The studio at Union Room currently use http://www.domaintools.com. 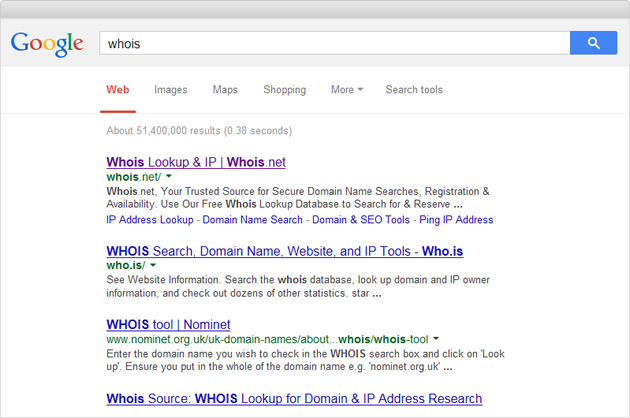 Doing a search in Google for Whois, brings up lots of sites that you can use to gain further information on your domain. Will my site and email be down while the transfer takes place? Unfortunately yes. Again you should plan ahead picking your quietest time for instance so that the transfer can take place. Depending on your provider and the suffix, the transfer process can take anything up to 24-72 hours, but in our experience the bottom time scale is more realistic. Make sure you have backed up all you previous email and maybe prepared a temporary Google Gmail or Microsoft Hotmail email account to warn all your contacts of the down time. You should also make sure your new account is set up ready to receive email as soon as your domain has been transferred. Like many things there are lots of options to consider before you transfer the domain fully, the following instructions provided outline the two typical methods for the two most popular domain suffixes – .co.uk and .com. Let’s start with the .co.uk. This is by far the most simple domain suffix to transfer. It’s as simple as asking your current hosts what their IPS TAG is (you will find this on their website or you can even ring them). Once you have this IPS TAG you need to give it to your new hosts so they can complete the transfer. You can do this via your new control panel you will have with them, or you can give it to your web design company who will complete the transfer for you. Take care though, you domain may be transferred but the name servers will stay the same and need to be changed to your new companies. For obvious security reasons your domain will be locked so that it can’t be transferred. You will need to ask your current registrar to unlock it for you. Many registers allow you to do this yourself through the control panel. Once unlocked most will leave it unlocked for anything between 10 and 21 days before they will close it again. Make sure you complete the transfer within their guidelines otherwise it will be re-locked and you will have to begin the transfer again. Once unlocked an email gets sent to the admin contact which you will need to complete the transfer, that’s why it’s very important to make sure your email address is listed as the admin contact. Having received the above email it will ask you for a EPP or Auth code which you current hosts will need to provide. Now that the code has been provided you can visit your new hosts and enter your domain into their search box and click transfer. 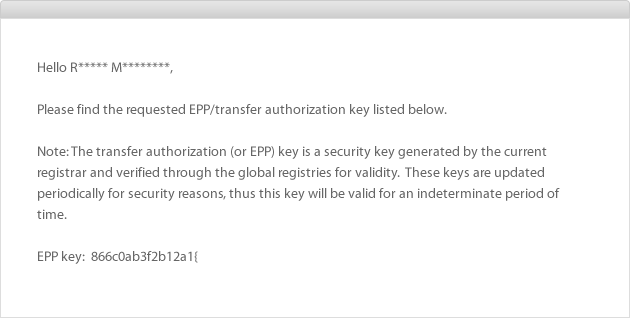 An example of the email containing the EPP or Auth Code that the admin contact will recieve when the domain is unlocked. Can you suggest a domain registration company that I can transfer my domain to? There are lots of domain registration companies available and doing a simple Google Search brings up a long list of mostly reputable companies some of which I’m sure you’ve used before. 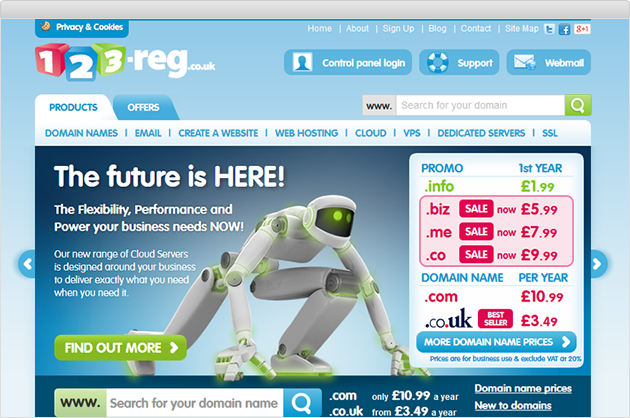 Our personal favourites that we’ve used or dealt with over the years are www.123-reg.co.uk, www.ukreg.com and www.1and1.co.uk. Don’t forget though if you are using a new web design company – liaise with them first as it will be the hosting and domain registration company that they use that you will have to transfer the domain to. They will be able to supply you with the necessary details for the transfer etc. Choose a start date for the transfer when your business is at its quietest. Back all your old emails. Set up alternative Gmail, Hotmail or a similar email account so that you can keep contacts informed when the wensite and email are unavailable. Have your website or even a landing in place on its new servers so that it goes live the instant the transfer finishes. Likewise do the same as above for all your new email address. When first initiating the transfer of a .com domain name an important email gets sent by the current hosting company to the registrants email address asking them to enter an auth code and approve the transfer. Make sure you know who is getting this email if it’s not yourself. If you don’t a lot of time is wasted trying to track people down or changing the admin contact details, resulting in needlessly holding the whole process up. 3. Is transferring the domain entirely the best option? As discussed above in ‘How do I transfer my domain?’ There are lots of different ways you can control where your domain points. If you are perfectly happy with your current domain registrant, but are having a new website build and need to point the domain to this new site consider instead a simple Nameservers or A Record change where the domain stays where it is and simply points to the new site. The process is a lot easier and often takes half the amount of time and also means there is no down time to your emails. 4. If organising your own hosting, make sure it has the relevant features on the new server. Going out and buying the first hosting package you see isn’t as simple as you think. It’s often best to talk things through with your web design company first to see what kind or server your web site requires. Unfortunately it’s not an exact science with so many variables that can go wrong. Once you or your web company initiates the transfer its completely out of everyone’s hands and its up to the two hosting companies involved to complete the transfer. Even once they have done their part the domains need to propagate across the world so everyone sees the same thing. Once you consider this you will understand why some hosting companies quote up to 72 hours. I’m not trying scare you in anyway, but just trying be realistic as possible so you know what to expect.